Let’s celebrate bibliodiversity on 21st September 2015 ! Preparations for the 5th edition of the International Bibliodiversity Day are underway all around the world. 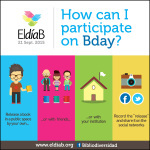 Follow B Day activities on this blog and on Facebook. And find out what is happening in your country and/or city !